On a wristwatch dial, the ability to indicate time in two different locations at a glance is an incredibly useful feature. 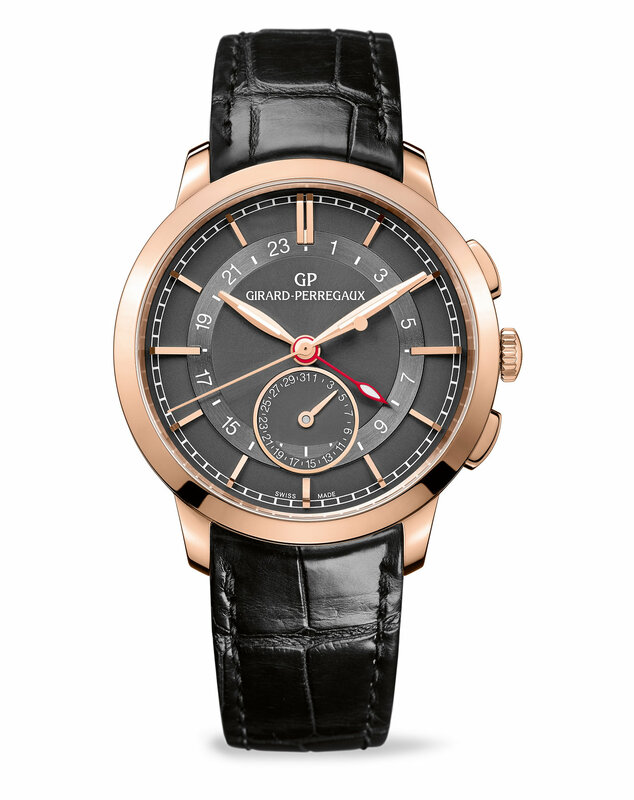 Girard-Perregaux take the “practical” and make it “beautiful” with two new 1966 Dual Time models. 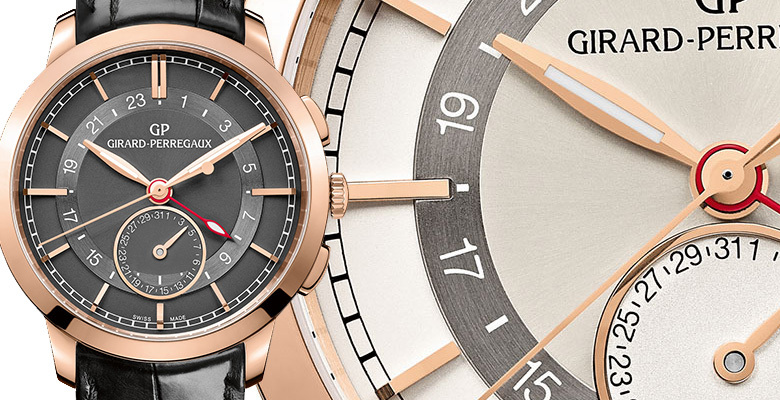 The Girard-Perregaux 1966 collection pays tribute to a time when the company received recognition for their research and development with regard to high precision movements. Throughout the collection the theme is understated elegance and for those who prefer in-house mechanical expertise without too much embellishment then the 1966 collection should provide much food for thought when considering your next timepiece. These models are the first in the 1966 collection to offer a second time zone and true to form, Girard-Perregaux have integrated the function seamlessly, resulting in a perfectly arranged and proportioned dial arrangement. 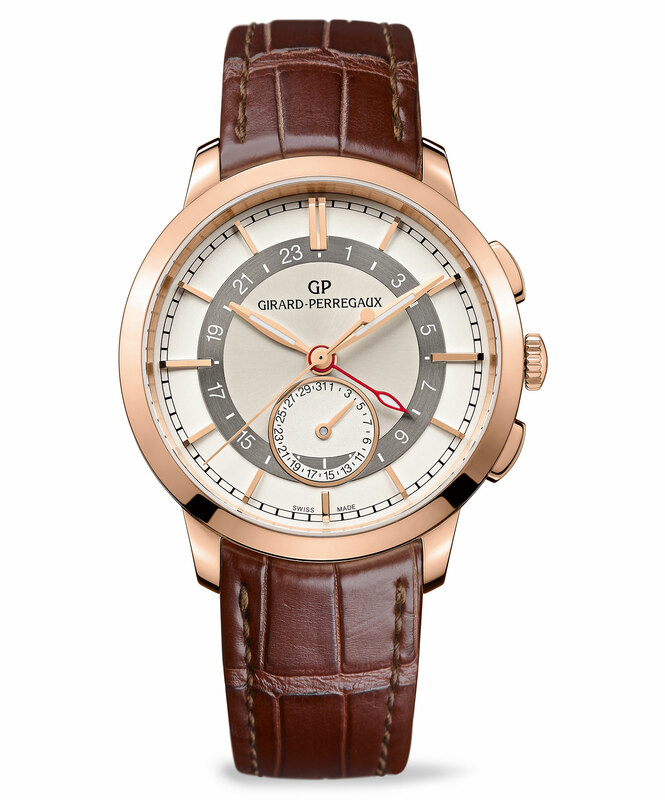 In order that the second time zone is readable at a glance, Girard-Perregaux have given it a vivid red hand and its own inner ring with a 24-hour graduation – a functional design addition which is a fine feature too. The home time hour and minute hands are leaf-shaped and luminescent, and their accompanying slender, elongated seconds hand reaches out to a traditional railtrack at the edge of the dial. The use of baton-style hour markers for the home time in place of numerals keeps the dial uncluttered and a charming pointer date indication takes up the 6 o’clock position. A compendium of rounded forms marks these models out as very special. The rounded case shape with its polished bezel, the inner satin-finished second time zone ring and the pointer date indication which has been overlaid onto it – all three elements conform to produce a superb alliance with one another. 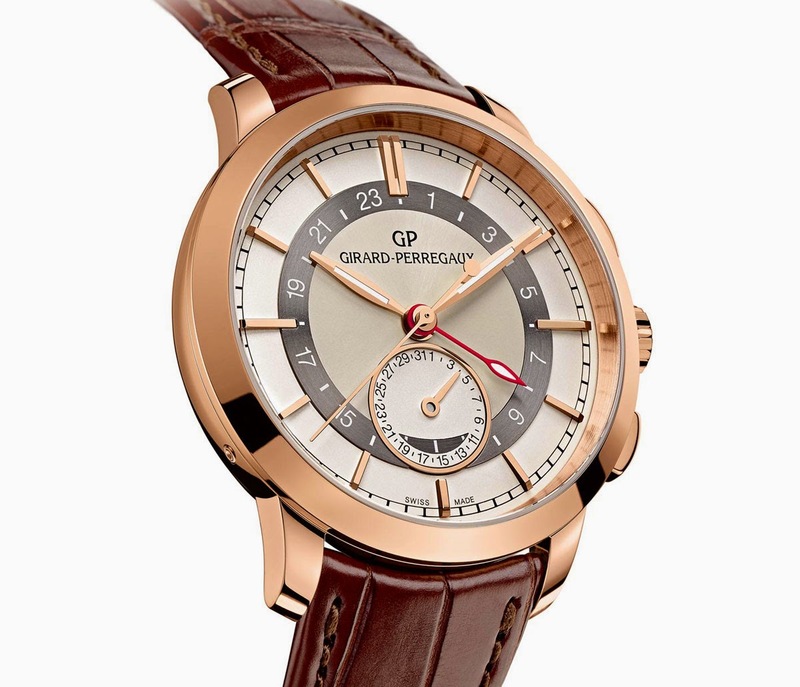 Girard-Perregaux have added two case-side pushers each engraved with either plus or minus to move the second time zone hand forward or back in one hour increments, allowing for fuss-free time-setting for even the most clumsy wearer. With rounded pink gold cases, sized at 40mm across, slightly domed dials and polished trim bezels, these models are the epitome of vintage styling, and curved lugs and a height of 11.7mm means that they will slip effortlessly beneath a tailored cuff. Inside each model, the automatic Girard-Perregaux GP03300-0094 movement can be viewed through a sapphire case-back allowing its fine craftsmanship to be admired. 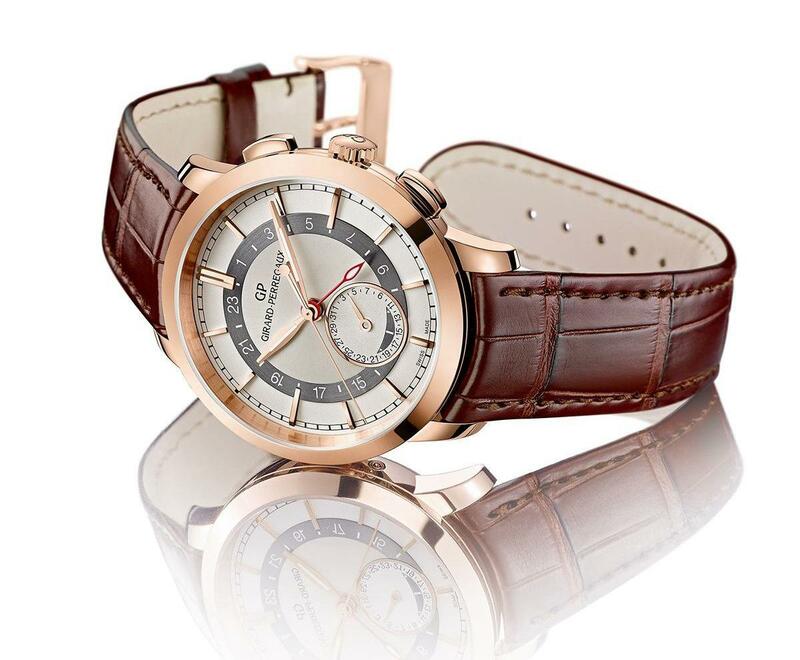 Power reserve is to 46 hours and the piece offers a water resistance of up to 30 metres. Two editions will be available, an off-white dial edition which has a brown alligator strap or an anthracite grey dial version presented on a black alligator strap. 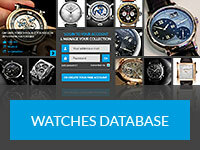 Retail price is expected to by $27,400.